Any "normal" license* (not a Subscription, not a Corporate Ultra) can be used as part of a License Pool. Creating a License Pool is a simple click of a button. 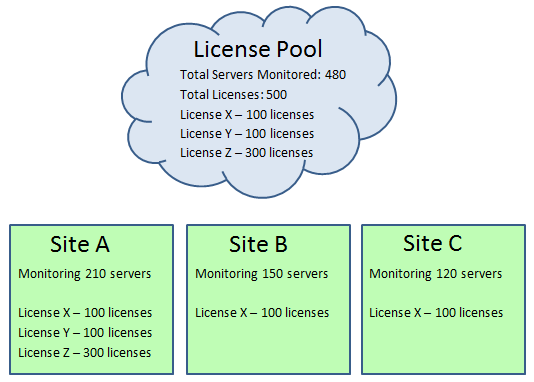 A License Pool is one or more licenses that can be used in multiple installations. The total servers/devices monitored across all installations is compared against the total number of licenses in the License Pool. Move the license from the existing installation to the new installation. The existing installation would no longer be licensed in this case. Turn the license into a License Pool so you can use the license in both locations. Once an installation is using a license from a License Pool, any other licenses* used in the installation also get added to the License Pool. License Pool installations connect to our licensing server once a day to check and see if there are more licenses available in the pool, and also to report how many servers/devices that particular installation is using. If more total servers/devices are being monitored than are licensed in the License Pool, the installation will send a reminder alert to obtain more licenses. After a couple of weeks of warnings, the servers that are unlicensed will stop being monitored as happens with non-License Pool licenses. * As has always been the case, an installation can only use one type of license (Lite, Pro or Ultra). That means a License Pool will only contain one type of license as well. With a non-License Pool installation, a license is activated once and that is the only contact you'll have with our licensing server (either via the Internet, or manually). That means installations with no Internet access won't be able to use a License Pool. Traditional License No need for Internet connection. Activates once. Can only be used in a single installation at a time. License Pool License Can be used in many installations. Different installations can all take advantage of the total License Pool license count. Requires an Internet connection so the installation can make one HTTPS request per day to find out about new licenses.